Today I broke up with my boyfriend on Facebook. In real life, we broke up four months ago. But, as everyone knows, Facebook makes things more complicated. Since I was the one who left him, I thought I should leave the Facebook-dumping to him. You know, mercifully leave him that small, quiet dignity. I learned the importance of waiting for the Facebook breakup from my last boyfriend. With Boyfriend #1, I jumped the gun on changing my status to “single.” As soon as it was over, even that same day, I logged on to Facebook and gleefully announced to the world my new single status. Boyfriend #1 was devastated. Seriously. It was heartbreaking enough to be dumped in real life, but to be so callously, unexpectedly, and publicly dumped on Facebook felt cruel. This time around, I had learned my lesson and decided that Dumped Boyfriend #2 would get the satisfaction of cutting our tie on Facebook himself. So I waited. And waited. Weeks passed. Each time I logged on to the site, I would examine our profiles carefully. Yes, to the public, we were still in a “relationship,” although in real life, of course, we had been over for months, didn’t speak much, and were moving on with our separate lives. This became tricky once I began to see other guys. Naturally, in this day and age, you have to expect that any guy you begin to date will immediately proceed to stalk you on Facebook. Seeing that you are “in a relationship” tends to scare them away. Or it scares away the good ones, at least. But I still couldn’t bring myself to be so heartless as to breakup with my ex-boyfriend on Facebook. At the very least, I figured, I had to give him some warning first. But since we never spoke, the conversation never came up. My short-term solution was to go into the labyrinthine Privacy settings and make it so that we were still in a relationship, but it would be invisible to everyone, except the ex-boyfriend, his family, and his friends. I was a genius! The problem with this approach is that, inevitably, you will forget to add someone to the short list who can see your relationship status, and then your ex-boyfriend’s brother casually mentions to him that “Hey, I see you and Daphne broke up on Facebook.” At which point, the game is over. I’m not sure that this happened. Well, actually, it did happen, but in the other direction. This weekend, well into the fourth month of the breakup, I did my weekly check-in of Ex-Boyfriend’s profile and saw that yes, we were still in a relationship. Imagine my surprise, then, when I was speaking with my brother, who happened to mention, “I see John finally changed his relationship to single on Facebook.” I was stunned. Had it finally happened? I immediately whipped out my iPhone to check. 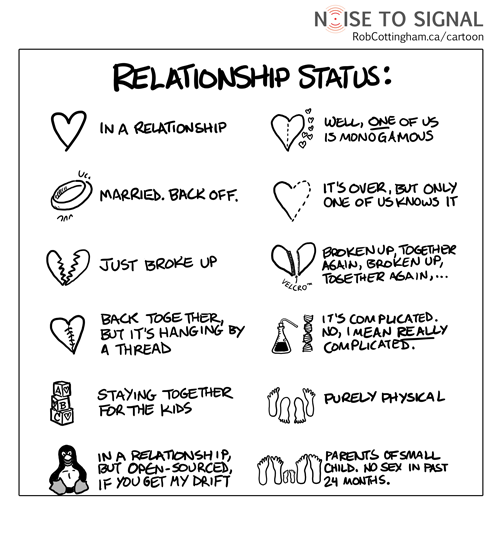 Hmmm… No, it says here that we are still in a relationship. Well, as it turns out, John had done the exact thing I did: left our relationship intact, but changed his privacy settings so that everyone (except me) would think he was single. It’s completely absurd and hypocritical, I know, but I was outraged and betrayed. How long had it been like that? If my brother hadn’t told me, when would I have found out? At this point, of course, our Facebook “relationship” had passed the point of absurdity. 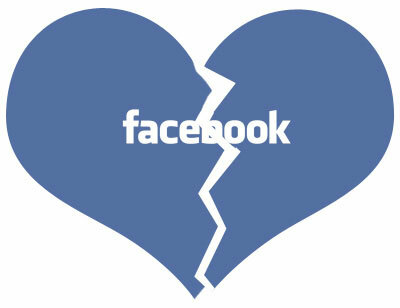 I felt no remorse as I finally, officially changed my status to “single” and broke our Facebook tie once and forever. However, no one would ever know it because I made it invisible in everyone’s news feed. And as everyone who knows us in real life is perfectly aware, we broke up four months ago. The point of all this is simple: never, ever agree to be in a relationship on Facebook. February 22, 2011. Tags: breakup, Daphne, Facebook, John. Uncategorized.